The Fraser Department of Public Safety Fire Division is responsible for providing fire protection and advanced life support services to the City of Fraser. Personnel assigned to the division are also responsible for ordering fire and medical supplies, conducting daily vehicle checks, and managing all equipment on the trucks and in the fire garage. In 2011 the department changed its operating structure. Originally, four public safety sergeants were assigned specifically to the fire division to handle fire duties. All public safety sergeants are now equally trained to handle all fire runs along with police runs. They are assigned as patrol / fire supervisors. One sergeant is now assigned to the fire division to complete fire inspections of all businesses in the city. He also conducts fire training for all fire personnel twice a month. Three department personnel have been trained to investigate cause and origin at serious fires. Four firefighter / paramedics are assigned to three platoons to provide advanced life support and fire response. The department operates four fire emergency vehicles. 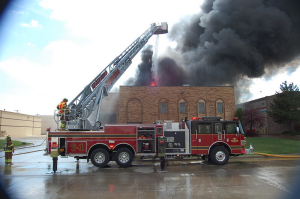 A 2007 Pierce 85’ aerial platform fire truck is our main fire attack vehicle. It is equipped with compressed air foam (CAFS) to extinguish fires in ¼ the time of water. A 1997 Ford KME fire truck is used on all injury accidents and has a Phoenix jaws of life along with other rescue equipment. A 1991 Ford Grumman 50’ aerial ladder fire truck is used as an additional fire truck at fires and for mutual aid to surrounding cities. A 2012 Chevrolet / Medtec paramedic ambulance is used for response to medical emergencies in the city.